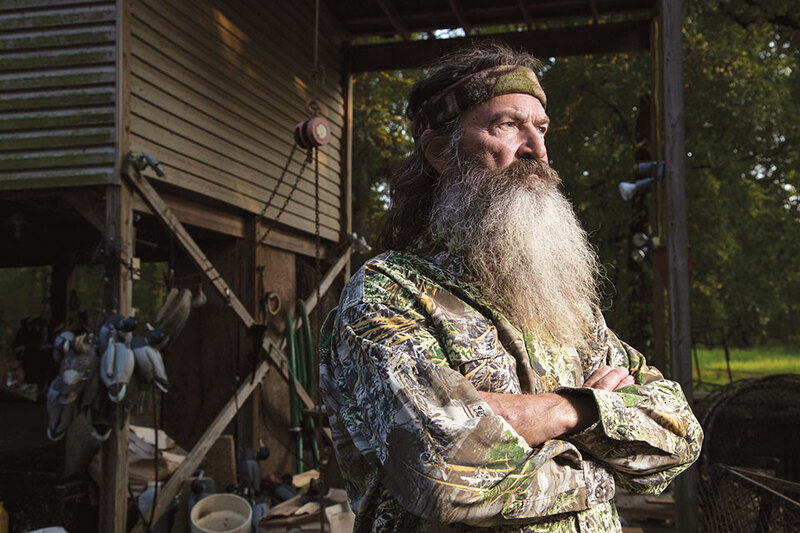 When a leading cable network decided to suspend the patriarch of America’s Top-rated cable program, the resulting firestorm exposed a clear divide on the moral landscape of our country. In an interview with GQ magazine, Duck Dynasty’s Phil Robertson referenced the Bible’s authoritative teaching on immoral behavior: “Or do you not know that the unrighteous will not inherit the kingdom of God? Do not be deceived: neither the sexually immoral, nor idolaters, nor adulterers, nor men who practice homosexuality, nor thieves, nor the greedy, nor drunkards, nor revilers, nor swindlers will inherit the kingdom of God” (1 Corinthians 6:9-10). Robertson’s orthodox, biblical view on the sin of homosexuality was immediately met with disdain from the intolerant gay community and its vast network of immoral, liberal allies. Robertson was suspended and eventually reinstated by the network after several days of intense national debate. An elder in his Louisiana church, he never backed down from his biblical stance. Many were offended by the Bible’s uncompromising teaching on morality. Others were offended by Robertson’s frank depiction of the homosexual act, which some called crude but was really an accurate description of the degradation of sin. I have heard our own vice president use crude, foul language in the President’s hearing. His vile remarks were met with laughter, not indignation. That was crude speech by our country’s second highest elected official, and a flippant dismissal by the commander in chief. But perhaps the real reason people were offended by Robertson was because the Scripture he quoted brought them face to face with their sinful state and the fact that God hates evil. The Bible says that the Gospel of our Lord and Savior Jesus Christ will be an offense to many. You see, we must face the bad news of our sin and depravity before we can receive the Good News of forgiveness through repentance and faith in Christ. Jesus is a “stone of stumbling and a rock of offense” (1 Peter 2:8) to those who walk in the darkness of sin and pride. As I have reflected on this event and the rising tide of evil and iniquity that threatens to engulf our nation, I have come to several conclusions. Like the church in Thyatira that tolerated immorality in its midst, the evangelical church today has grown all too accepting of sin. The church is ducking the vital moral issues of our age. Rather than influencing our culture by being Gospel salt and light, the church has itself become influenced by the permissive culture in which we live. The holy, blood-bought church of the Lord Jesus Christ is far more accommodating of sin than ever before. In many churches across America, homosexuals, adulterers and sexually active youth can sit in the church pew and rarely be confronted by the convicting Word of God. Of course, the grace of God that leads to salvation through genuine faith and repentance should always be declared. It is God’s love for sinners that the Bible proclaims, yet that is always in the context of satisfying the wrath and justice of God through the death of His Son. Grace isn’t cheap. It cost the Father the death of His beloved Son. Men and women who habitually and consistently practice sin should experience the convicting work of the Holy Spirit. There are far too many churches that tolerate members who deliberately pursue a sinful lifestyle in an open and unrepentant manner. Unfortunately, when that occurs—and it does all too often—the purity and holiness of the Bride of Christ is sullied, and the witness of the church in a corrupt culture is compromised. A low view of sin grows when the church loses sight of the majestic holiness of God. Sin brings death. Sin corrupts. Sin destroys. Sin is so evil that the Son of God had to humble Himself and come to die on a Roman cross so that we might be forgiven and justified before a holy God. The more we focus on God’s absolute holiness, the less we will tolerate sin of any kind. We will never be sinless on this earth, but we can sin less and less as we reverence and fear our holy Savior who loved us and gave Himself for us. I do not believe this is simply a culture war, or a battle between conservative and liberal elements of our society. It is much more than a drift away from the moral underpinnings that helped found and guide our nation for centuries. This is a full-scale assault against Christianity and the followers of Christ. When prayer is banned from the public square, when our President fails to defend biblically defined marriage, and he openly and zealously advocates for gay rights; when legislators rush to overrule existing laws to promote gay marriage; when schools and courts consistently suppress religious freedoms; we know we are locked in a war against the Christian faith, not culture. The architect behind this offensive is none other than Satan himself. The Scripture says that the devil, our archenemy, is bent on as much destruction as possible. “But woe to you O earth and sea, for the devil has come down to you in great wrath, because he knows that his time is short” (Revelation 12:12). Satan knows that one day very soon, he will be cast into the lake of fire and sulfur in hell (Revelation 20:10). As that day draws near, his malicious, hellish activity is intensifying. He has already been decisively defeated on the cross by the Lord Jesus Christ, who took away his ultimate weapons of death and condemnation. For now, however, he still has power to work woe on earth. “The whole world” the Apostle John wrote, “lies in the power of the evil one” (1 John 5:19). Behind the well-orchestrated attacks on the church is the evil one who hates the Name of Christ as well as believers who have been rescued from his sinful grip. The worldly systems of politics, courts, entertainment and education can be instruments of devilish harm unless they are under the influence of Christian precepts and principles. This is why we see Christians and the Christian faith under such intense attack today. The enemy of our souls is working his wicked schemes that seek to suppress and oppress believers. We know that in the end, he will miserably fail, for Christ is the Victor. The Bible says in 1 John 5:18 that Jesus, who was born of God, protects believers, and Satan cannot touch them. Satan’s power is always restricted by our sovereign God, and the rule and reign of God’s Kingdom cannot be stopped. The Apostle Paul said: “The God of peace will soon crush Satan under your feet” (Romans 16:20). This is a critical hour for the church. We cannot duck the moral issues of our day, because the clear aim of our adversary is the church itself. We must take a bold stand for the truth in every arena of our lives, deal ruthlessly with sin in our own heart and be men and women of uncompromising holiness. I encourage you to examine yourself. If there is ongoing sin in your heart, repent quickly and turn to the Lord, where you will find forgiveness and help in the battle against the power of sin—a sure and certain help and hope. Be zealous to repent, as Christ exhorted the lukewarm church in Laodicea. Now is the time to “be watchful, stand firm in the faith, act like men, be strong” (1 Corinthians 16:13). Scripture quotations taken by permission from the Holy Bible, English Standard Version.